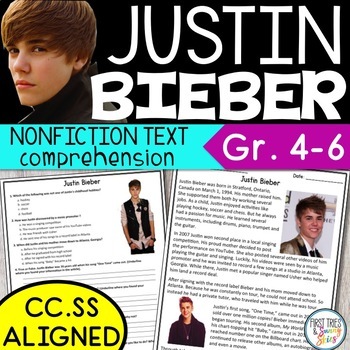 This Justin Bieber Nonfiction Comprehension Passage is the perfect way to engage your students in reading an informational text. This Common Core aligned text also comes with comprehension questions including multiple choice and short answer (answer key included). Your students will love reading about one of today's popular stars. Best for Grades 4-6.